American all wood stained cabinets in oak and maple. Limited selection but quick delivery and very inexpensive. Stock American furniture board cabinetry with plywood side upgrade available in oak, hickory, birch, maple, cherry, thermofoil, and decorative laminate veneers, glazed finishes are also available in a variety of door styles. American cabinets that can be modified in red oak, rift cut oak, maple, cherry, alder, beech, birch, and paint. Stained cabinets are available with glazed finishes, and are available with rustic, knotty and distress finishes with a variety of door styles. Semi custom all wood or furniture board American cabinetry built to order in oak, maple, rustic alder, cherry, rustic cherry, hickory, rustic hickory white and linen white painted and thermofoil doors with glazed finishes available in a variety of door styles. Custom built all wood American and European cabinetry in, alder, knotty alder, furniture maple, maple, cherry, rustic cherry, are available in many stained, glazed, distressed and painted finishes, in classic, contemporary, and traditional designs. Traditional inset, and beaded inset construction. Fine, custom built, all wood or furniture board American and European cabinetry in maple, knotty pine, hickory, rustic hickory, cherry, rustic cherry, mahogany, knotty alder, cherry, maple, and quarter-sawn white oak. Also available in many exotic woods such as birds-eye maple, black walnut, and butternut. Available in custom stained, glazed, distressed and painted finishes, in classic, contemporary and traditional designs. Traditional inset and beaded inset construction. Many different edge treatments are available on custom built countertops of laminate, Corian solid surface, Zodiaq quartz, granite, marble, wood, and stainless steel. For more information, call or Phil Austin at Custom Cabinetry Designs - 508-563-3666. 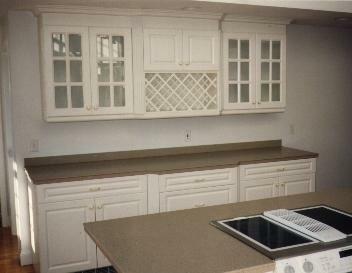 ©1997-2008 Custom Cabinetry Designs, all rights reserved.